The “something new” is easy, the Bride’s wedding gown is most often new, but some girls choose to wear a pre-loved wedding gown, or a family heirloom such as their mother’s or grandmother’s bridal gown. 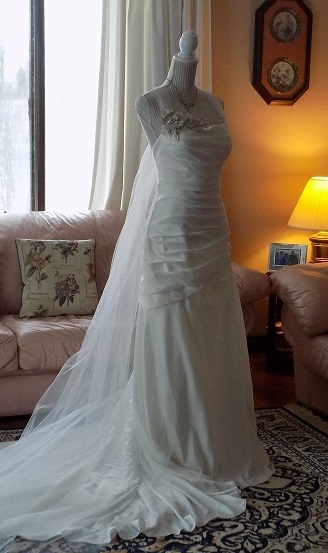 The Organza Vintage Bridal Gown with matching veil - size 8 shown on the right is around 50 years old, and looks beautiful on this modern bride. This is lovely and if a vintage gown can be made to fit and look good, then all is well, and you have your “something old”. If, on the other hand, the gown needs a complete make-over, you will need the help of a skilled seamstress, or at least a bridesmaid who is handy with a sewing machine! 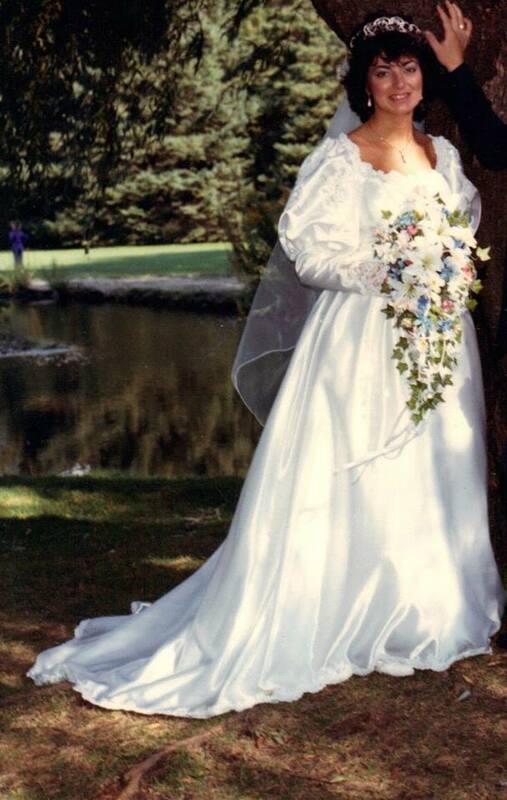 A 1980′s satin wedding dress with long sleeves, with sparkles and sequins, such as this Snow White Satin Bridal Gown could look beautiful when the elaborate sleeves have been removed and the train shortened. Wearing your mother’s wedding dress doesn’t mean that it has to look exactly the same as when she wore it. With skill and imagination, and a little snip here and there, an older gown can look beautiful. There are also Consignment Bridal Stores which sell, for a small commission, gently used and new Wedding wear, and you can often purchase a spectacular gown for much less than the original cost of the gown when new. “Something borrowed” could be hiring a wedding dress, which is also an option as there are Bridal Rental companies in most large cities where you can rent beautiful gowns such as this elegant Da Vinci Charmeuse Satin Gown with Tulle Train for a fraction of the cost of buying a wedding dress. When you rent a gown, the cost usually includes the alterations needed to make the dress fit you well, and you can also rent the accessories such as the veil and / or wedding gloves, if you wish to wear them. Once you have made your selection and any alterations have been made, your gown can be picked up a couple of days before your wedding and returned two days later. You can also borrow a dress from a friend or relative, as I did for my first wedding in 1973. A cousin of my husband’s had been married the previous year and asked if I would like to borrow her wedding dress – I tried it on and was delighted to find that it fit me to perfection! How lucky was that? Your wedding jewelry could also be something you could borrow, from a friend or relative – how lovely to wear your grandmother’s string of pearls on your wedding day! The “something blue” could be a dainty blue lace-edged handkerchief tucked into your bodice for your wedding. 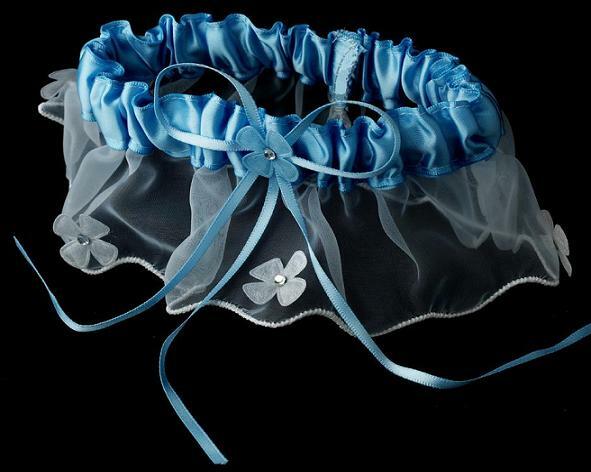 A Bridal Garter is also a fun way to incorporate the colour blue into your wedding outfit. You could incorporate your favourite shade of blue into your wedding as your bridesmaids colours and wear a matching waist sash on your gown. When you order your Wedding Gown online, you can have your wedding gown sash and bridesmaid’s dresses made to co-ordinate, which is lovely – blue bridesmaid’s dresses and a blue waist sash for the bride.